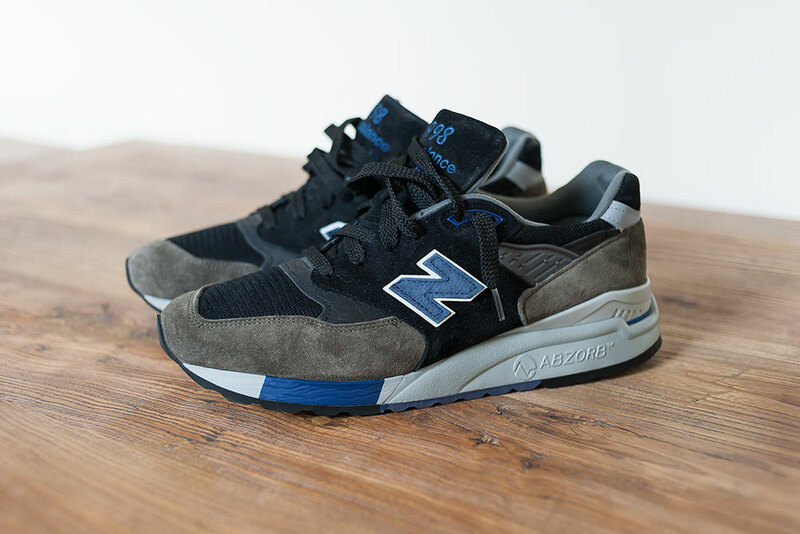 To showcase my shaping technique I am using a pair of JCREW X New Balance M998BC1 'Nighthawk' sneakers. I have included an after shot here to show you the result we are looking at getting. I picked these up second hand recently so I have also included a few hints and tips on removing glue from suede and also cleaning dirt. I would add I am a big believer in wearing sneakers, I try to wear all mine, although given how many I own it is quite a challenge! 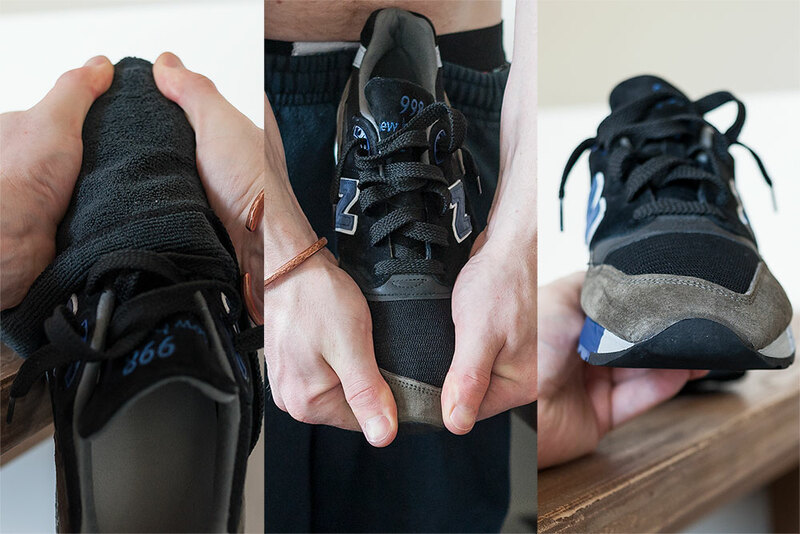 I only tend to clean major marks and get rid of glue stains, at the end of the days sneakers are going to get dirty, I kind of like things acquiring their own individual personal style. With the constant changing shape of some popular sneakers, won't drop any names, you know who you are from the countless forums of sneakerheads firing up! 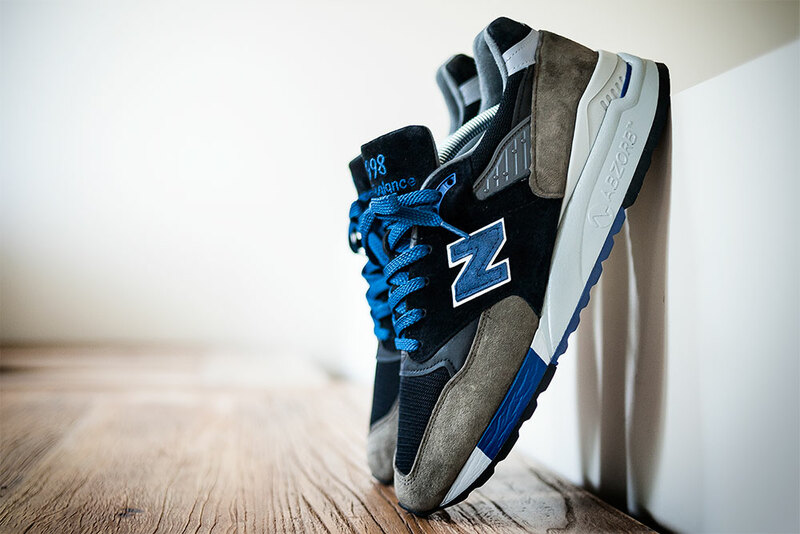 People who fell in love with the old classic sneaker silhouettes have been constantly finding ways to work the old classic shapes into the more recent releases which invariably lose this along the way. Despite reshaping being prevalent in the sneaker scene, it also seems to be this underground hidden art form. Having asked people about their techniques and pretty much been blanked I did what any person does, figured it out for myself. I am here to share my method with you all. There are lots of techniques out there, this one works for me so I hope it helps. I like that it is a none invasive technique so you do not need to take the trainers apart to get these results. Just elbow grease and a few household items will do the job. For me the light bulb moment came when I was out shooting sneakers. Most people into shooting sneakers, will know that a slight toe press brings the sneaker flat to the floor and gives a nice aggressive shape. This triggered my thought process, as you bring the mid sole flatter to the floor it brings the toe box forward and creates the aggressive sharp shape we all know and love. So I set about working on some techniques to produce this. It also struck me that most often we love the shapes of the older sneakers. 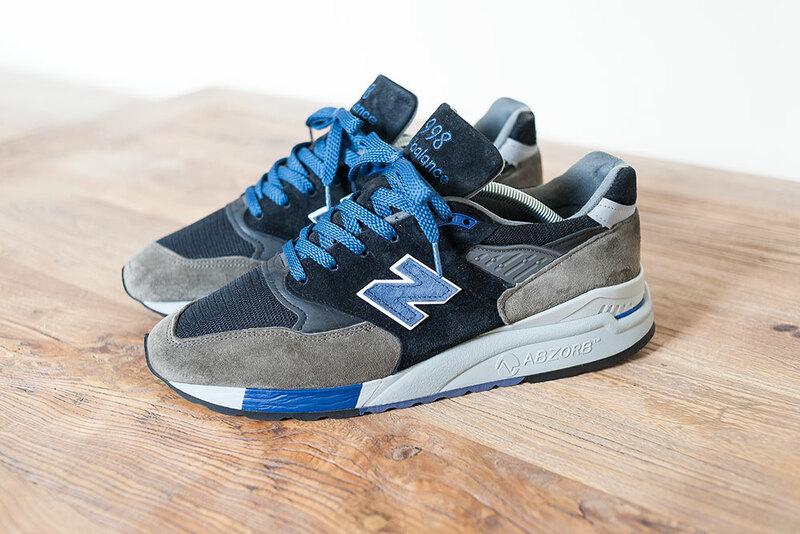 The interesting thing here is because generally these sneakers have been worn a lot the midsole has softened and this shaping process has taken place naturally through the sneakers been used and abused. Big lesson here guys is wear your damn sneakers, pretty much the more you wear them the better they will look!! At least that is my philosophy. Anyway back to the reshaping process. I have included a series of pictures to try and help show you my method with some directions as we go, hope it helps you guys out there wrestling with reshaping and how to go about it. Please bear in mind I have creased up some of my pairs through trial and error in working out this method. Prime example with my first try I did not stuff the toe box and ended up with a creased toe box, obviously I don't really care that much as my sneakers all get worn, but wanted to give you fair warning if you are precious over your kicks. Hopefully you can benefit from my experimentation. Bottom line though I am not responsible for any damage to your sneakers if you choose to use this method. So lets get started here is a before shot of the sneakers straight out the box as I received them. Now I gotta say damn, that is UUGGLLLYYYY viewing! The classic ski slope that seems to have infiltrated the sneaker scene! Obviously bear in mind these have been used. So now it is time to transform these classics into something reflecting their true heritage and vintage shape. 1. 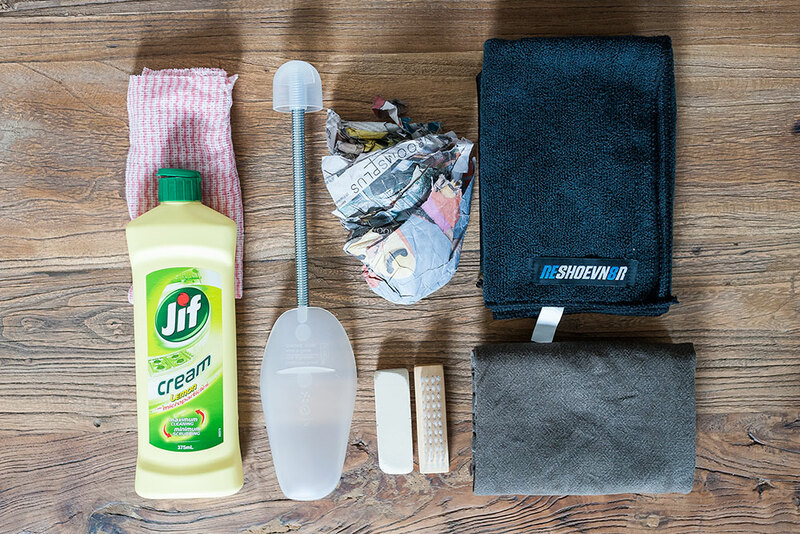 Jif cream, flannel towel and some luke warm water (used to clean up the under sole and mid sole). Also a rag to dry things down. I only tend to do this occasionally for any nasty stains. Just be careful using this on coloured sections of mid soles. 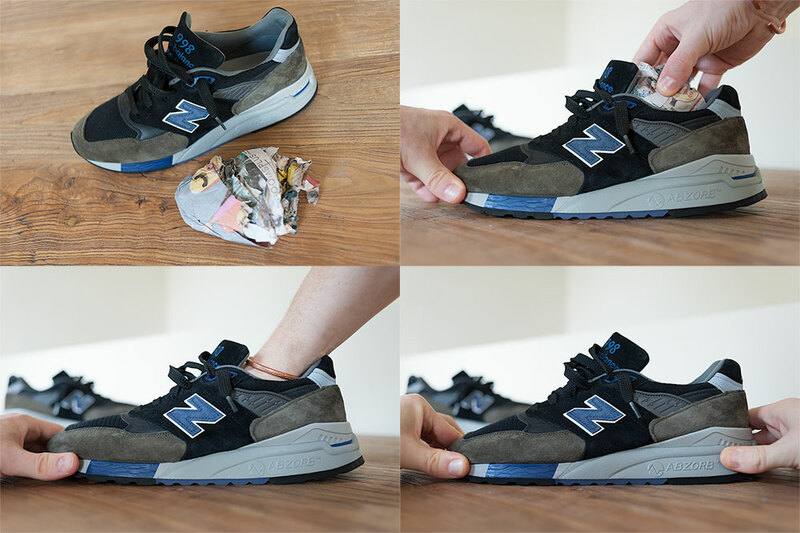 I rarely do this and to be honest I tend to give it a miss as I wear my sneakers so accept they will get dirty. 2. Suede eraser and suede brush (these are actually from my Red Wing boot collection and I use them on the Red Wing roughout leather. They work perfectly on removing those god awful glue stains in suede, which seem to be more and more prevalent in some of the manufacturing these days. 3. Spare Shoe Tree, newspaper to stuff toe box, clean towel (Reshoevn8r microfiber cloth in this instance) for the reshaping process. 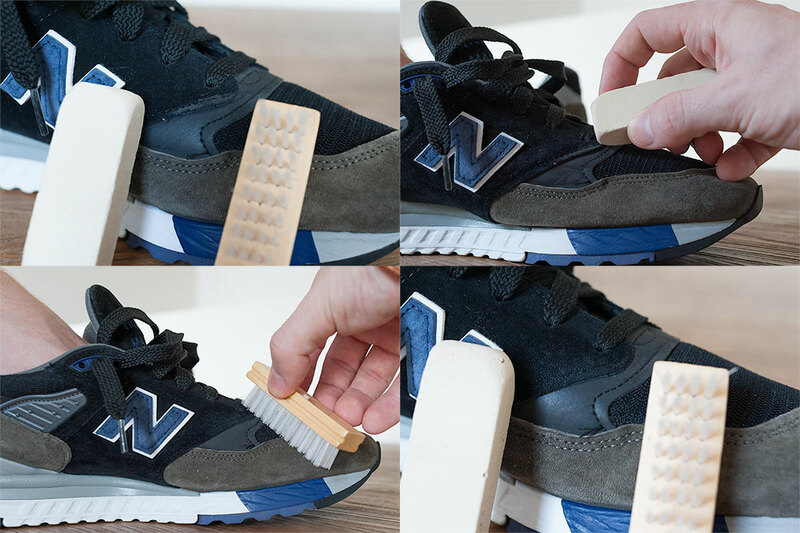 This is to handle the sneakers as you will see further down in this process you will be working on them pretty hard so it is important to have a good protective layer to protect the materials. So we start by making sure the toe box is well stuff so as you bend the suede it maintains a smooth surface and does not crease. You can see in the last shot what we are aiming to do get that midsole nice and flat to the floor, which you can see pulls the toe box forward and creates that epic shape. You need to use the edge of the table and with one hand pressing down on the insole at the heel end, use your other hand to bend over the toe. You will want to cover the toe box with a clean cloth of some sort, I used a microfibre cloth from Reshoevn8r. I have taken a shot without the cloth so you can see just how much I bend them, you don't want to be shy with this. The reason for the cloth is with the force you impart if you have even slightly oily/dirty hands it will mark up the suede. 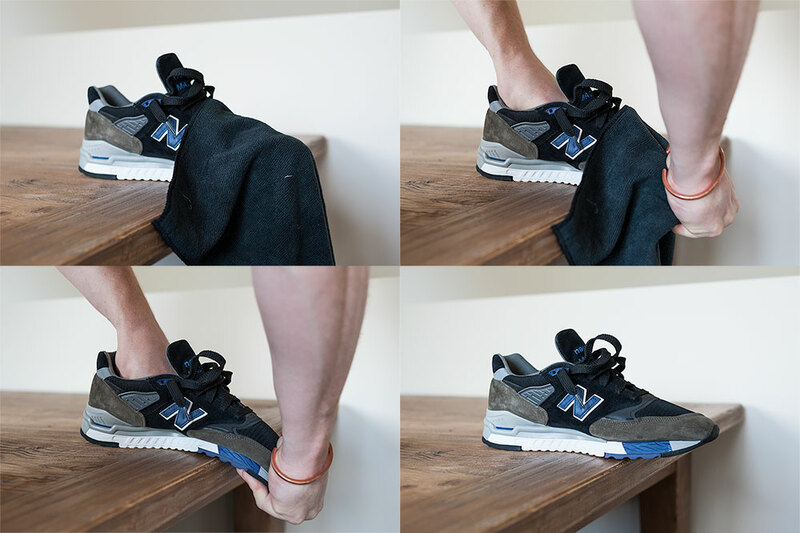 You will want to do this bending process repeatedly as you slide the sneaker further back onto the table until you only have the end of the sneaker just over the table, this will ensure you flatten out that mid sole and get rid of that god awful ski ramp I referred to earlier. In the last shot you can already see the shape improvement. 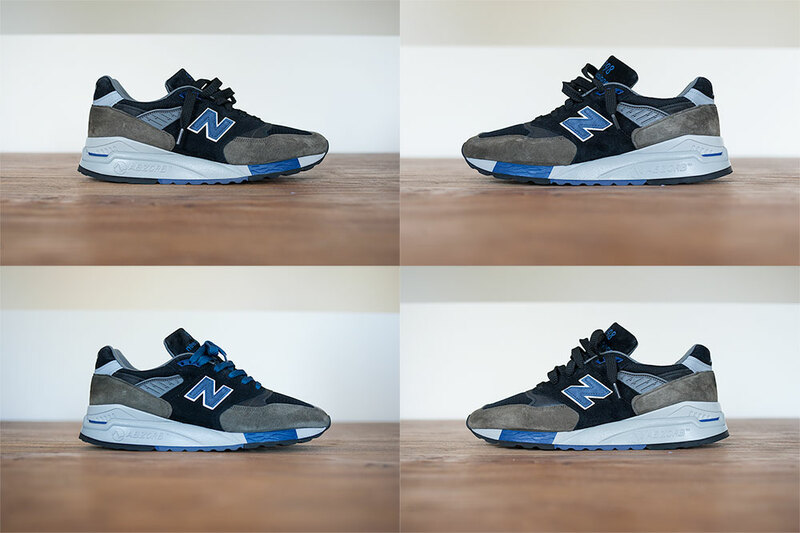 The next step is to hold the toe box between your hands with your fingers reaching round underneath and then pull the toe box out and down, I have tried to show this in these pictures. This will emphasis the toe box staying smooth and aggressive, as you can see in the last shot. Combining both of these techniques will give you a sweet result. 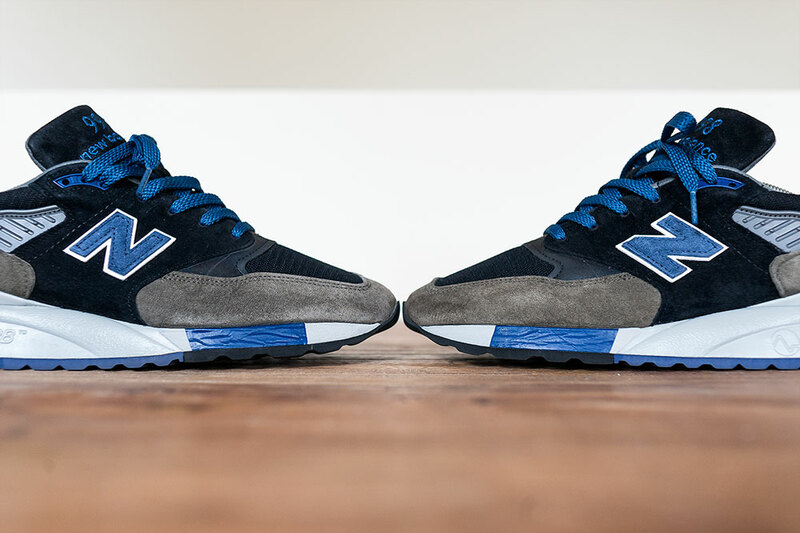 Just check out the before and after shot of these sneakers below. I have taken these without shoetrees in them. This is to show you the natural effect of doing this reshaping, as shoe trees always over exaggerate the shape of a shoe. Pretty nice result in the end I think you will agree. The other thing worth mentioning is how your sneakers fit. This will have an impact on the shape your sneakers take. I like my sneakers to fit snug and this definitely helps with creating an aggresive shape as the toe box is packed out properly. The looser your sneakers are in my experience the worse shape they will end up in. Obviously you want your sneakers to be comfortable, so I am only talking about making sure your sneakers fit properly. Always buy your correct size, I would strongly advise against sizing up no matter how much you crave a pair (I am speaking from experience). There is nothing worse than sneakers that are too large! This is personal taste though, just figured I would mention it. I have included some shots of these with the shoe trees in them below, if you want them to hold their shape well, you will want to put shoe trees in them. Useful tip on this is IKEA sell shoe trees HERE for AU$2/pair so pretty affordable way to look after your sneakers when you are not wearing them. 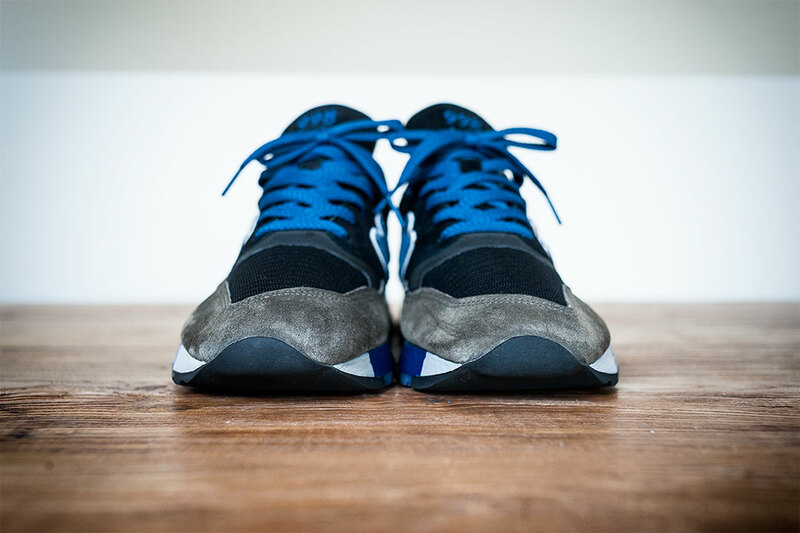 This reshaping process might need to be done a few times, then as you wear the sneakers they will naturally take on this shape as they soften and wear in. 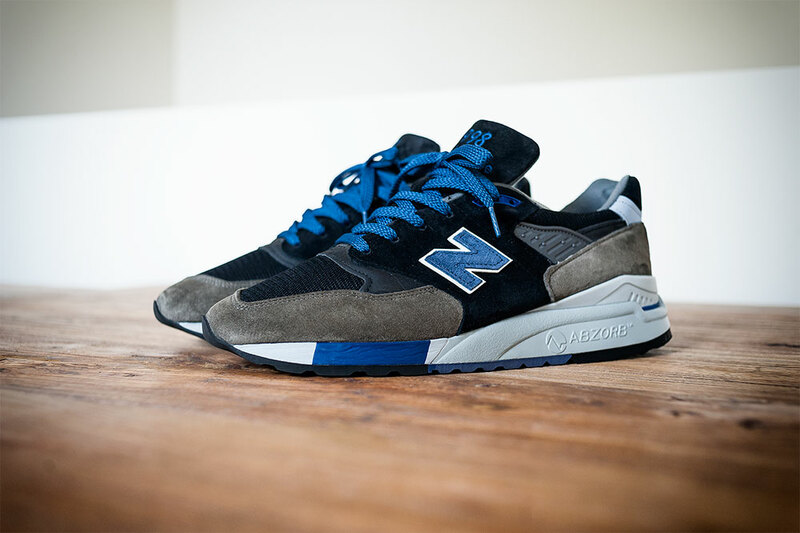 Also bear in mind this will only work on softer materials suedes, and some nubuck if soft enough. I have used heat from a hair dryer to soften more sturdy materials, and will share this technique in my next shaping tutorial, when I have a bit of time. I really hope this has been useful and please share this with any of your friends. I am always happy to help if you have any questions as well. Enjoy. Great article mate that's well explained and the comparison pictures are spot on! Top job.